Definition at line 77 of file ip.h. Definition at line 85 of file ip.h. Referenced by AddGenericHeaderIPv4(), AddUDPHeaderIPv4(), DGDeliverData(), ICMPReceive(), ICMPReply(), ICMPTransmit(), main(), PrepareICMPPacket(), ReassembleDatagram(), and UDPReceive(). Definition at line 90 of file ip.h. Referenced by GetReassemblyInfo(), ICMPTransmit(), IPv4Receive(), PrepareICMPPacket(), RawIpReceive(), ReassembleDatagram(), and UDPReceive(). Definition at line 80 of file ip.h. Definition at line 78 of file ip.h. Referenced by ICMPTransmit(), IPInitializePacket(), IPReceive(), LanReceiveWorker(), LoopTransmit(), ProcessFragment(), ReassembleDatagram(), and SendFragments(). Definition at line 83 of file ip.h. 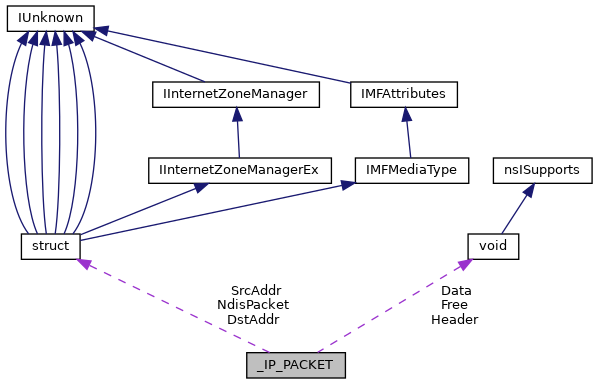 Referenced by AddGenericHeaderIPv4(), AddUDPHeaderIPv4(), DeinitializePacket(), DGDeliverData(), DisplayIPPacket(), GetReassemblyInfo(), IPDispatchProtocol(), IPv4Receive(), LoopTransmit(), main(), PrepareICMPPacket(), ProcessFragment(), RawIpReceive(), ReassembleDatagram(), RunTest(), SendFragments(), TCPReceive(), and UDPReceive(). Referenced by AddGenericHeaderIPv4(), DGDeliverData(), DisplayIPPacket(), ICMPReceive(), ICMPReply(), ICMPTransmit(), IPv4Receive(), PrepareICMPPacket(), ProcessFragment(), ReassembleDatagram(), SendFragments(), and TCPReceive(). Definition at line 81 of file ip.h. Referenced by AddGenericHeaderIPv4(), DeinitializePacket(), IPv4Receive(), LoopTransmit(), PrepareICMPPacket(), and ReassembleDatagram(). Definition at line 88 of file ip.h. Referenced by AddGenericHeaderIPv4(), AddUDPHeaderIPv4(), DeinitializePacket(), DisplayIPPacket(), IPReceive(), IPv4Receive(), LanReceiveWorker(), LoopTransmit(), PrepareICMPPacket(), ProcessFragment(), and SendFragments(). Definition at line 87 of file ip.h. Referenced by IPReceive(), IPv4Receive(), LanReceiveWorker(), ProcessFragment(), SendFragments(), and UDPReceive(). Definition at line 82 of file ip.h. Referenced by DeinitializePacket(), LanReceiveWorker(), and ProcessFragment(). Definition at line 89 of file ip.h. Referenced by GetReassemblyInfo(), ICMPReply(), IPv4Receive(), RawIpReceive(), ReassembleDatagram(), and UDPReceive(). Definition at line 86 of file ip.h. Referenced by AddGenericHeaderIPv4(), DisplayIPPacket(), ICMPReceive(), ICMPReply(), ICMPTransmit(), IPv4Receive(), LanReceiveWorker(), LoopTransmit(), main(), PrepareICMPPacket(), ProcessFragment(), RawIpReceive(), ReassembleDatagram(), RunTest(), SendFragments(), TCPReceive(), and UDPReceive(). Definition at line 79 of file ip.h. Referenced by DeinitializePacket(), IPDispatchProtocol(), IPInitializePacket(), IPReceive(), RawIpReceive(), and UDPReceive().